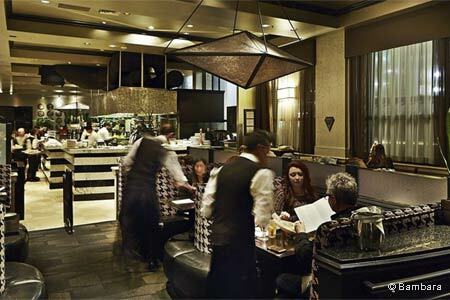 Hip and polished urban bistro nestled in the Hotel Monaco right in the heart of downtown. : With its bronze light fixtures, arched windows and velvet curtains, the restaurant at the Hotel Monaco Salt Lake City has an urban, sophisticated feel. Executive chef Nathan Powers, who worked at San Francisco restaurants like Stars, Hawthorne Lane and Farallon, has created a seasonal, modern American menu that favors sustainable ingredients. Starters include blue cheese house-cut potato chips or crab-stuffed piquillo peppers. From the entrées, Riesling-braised Duroc pork shank is a standout. Diners can complement their meal with a selection from the mostly American wine list, with many options available by the glass, or with a local brew such as Polygamy Porter or Provo Girl Pilsner. One of the best deals in town is the Power Lunch: three courses for $13. And the restaurant has lunch and dinner menus for those needing gluten-free options, too. Don't bother hunting for nonexistent street parking; use the valet or you'll miss dinner.